The Pinan / Heian series are often the first katas taught in the majority of modern dojos. This can lead to the Pinan / Heian katas being thought of as nothing more than introductory forms that are really only suitable for children and junior grades. However, it is my belief that the Pinan / Heian katas are grossly undervalued and do in fact represent a coherent fighting system in their own right. It is this viewpoint that we will be exploring in this series of articles. It was Anko Itosu who developed the Pinan / Heian katas. Itosu was born in the Shuri Region of Okinawa in the 1830s. In Gichin Funakoshi's book, ' Karate-do Nyumon ', Anko Itosu is described as being of average height with a huge chest that gave him 'the silhouette of a barrel.' Funakoshi goes on to say that despite Itosu's long flowing beard he had the face of an innocent child. It is also said that Itosu possessed great physical strength - in particular his grip strength was said to be exceptional - and that he was a very able martial artist. The word 'Pinan' is made up of two ideograms. The original Okinawan pronunciation of the first ideogram is 'pin', whereas the Japanese pronounce it 'hei.' Wado-Ryu & Shito-Ryu practitioners tend to favour the Okinawan pronunciation of 'Pinan', whereas Shotokan stylists favour the Japanese pronunciation of 'Heian'. Regardless of favoured pronunciation, the word 'Pinan' means, 'peaceful mind'. In 'Karate-Do Kyohan' Gichin Funakoshi, who was a student of Itosu's, said that the name 'Pinan' was chosen for the series because once these katas have been mastered, the karateka can be confident in their ability to defend themselves in most situations. If this is true, it would mean that the Pinan series would need to include techniques for uses at all ranges of fighting. In addition to the familiar strikes, they would also need to include throws, takedowns, holds, chokes, locks etc. It is my understanding that the Pinan series does indeed include all these methods; however, it would be fair to say that these methods are not widely practised. As mentioned earlier, the Pinan katas are often thought of as training methods for beginners or children and therefore they are often undervalued by more experienced karateka. One of the reasons for the Pinan series being viewed in this way is the fact that they were established in the early 1900s, which was around the same time that Itosu was introducing karate onto the curriculum of Okinawan schools. Some say that the Pinans are merely watered down versions of the advanced kata and were developed solely for children. If this were the case then why did Itosu also teach the Pinans to his adult students? Also, why did he choose a name which is said to be related to the combative function of the katas if they have no combative function? It is far more likely that Itosu had developed the Pinans over a period of time prior to the introduction of karate onto the Okinawan school system and meant for them to be a synthesis of his favoured methods. When Itosu was introducing karate into the Okinawan schools, the Pinans would be the natural choice of kata because they are relatively short. The main difference between the adults' and children's training would simply be a matter of approach. The children would be taught the solo forms, without their applications, and would perform them as a form of group exercise; whereas, the adults would be taught the complete fighting system. As time has passed, it is the 'children's approach' that has became the most widely practised. In addition to the change in emphasis from fighting skills to group exercise, the order in which the Pinan katas are taught has also changed over time. In the vast majority of today's dojos, it is the second of the series (Pinan Nidan) which is the first kata taught. The reason for this is that Pinan Shodan is generally accepted as being technically more demanding than Pinan Nidan. This difference in technical difficulty prompted Gichin Funakoshi to rename 'Heian Nidan' as 'Heian Shodan' and vice-versa so that within Shotokan the names for the forms reflect the modern order of teaching. So why did Itosu choose the order for the series that he did? Why was Pinan Shodan (now Heian Nidan in Shotokan) originally the first one taught? As we have already discussed, in most of today's dojos the Pinan / Heian series are practised as a form of exercise, and the modern teaching order of the katas reflects their relative technical difficulty. So what was Itosu's original order based upon if not their technical difficulty? It is my belief that Itosu designed the Pinan / Heian series to be a coherent fighting system and that the original order of the katas reflects the order in which these fighting methods should be taught i.e. the first stages of the fight are taught first. If allowed to progress, a physical altercation will generally go through a series of stages: Pre-fight (verbal exchanges, aggressive body language), limbs coming into range (strikes, attempted grabs etc), grips being established, and finally grappling. Not every single fight will progress in exactly this way, but it should be obvious that a grip cannot be established until limbs come into range, and there will be no grappling until some kind of grip has been established. We should always aim to end fights as soon as possible so that the fight does not progress. Therefore, when teaching self-protection, it makes sense that we should deal with the earliest stages of the fight first. I believe this is the approach adopted by Itosu when formulating the Pinan Series. The pre-fight ritual (aggressive language, posturing, controlling distance etc) would not be effectively recorded within a kata and should be something taught prior to a student leaning 'fighting skills'. Therefore, if my theory is correct, the original order of the Pinan series should deal with the initial exchange of limbs first; they should then progress to dealing with grips being established; and finally move on to techniques for use when grappling. This is exactly what the Pinan series does when taught and practised in the original order. 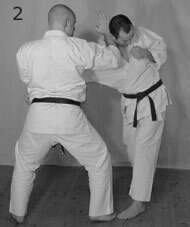 Upon analysis of the applications of the five Pinan katas, we can see that Pinan Shodan (Heian Nidan in Shotokan) contains techniques that predominately deal with the initial exchange of limbs. Pinan Nidan (Heian Shodan) predominately covers techniques that follow on from the initial grip. This includes techniques where you have grabbed an opponent, and techniques to counter an opponent's grip. Pinan Sandan is a grappling kata that includes a number of throws, takedowns, locks and other grappling techniques that can be utilised when you and the opponent are locked in a clinch. Over this series of articles we will see that by the end of the first three katas we have techniques that can be applied at all stages of a fight; exactly as the name 'Pinan' is said to represent. So what do Yodan and Godan teach? In addition to the main progression based on the stages of a live fight, the Pinan series also includes a sub-progression based upon the relative technical difficulty of the applications. This is not to be confused with the technical difficulty of the solo performance of the katas, although the relative difficulties are not unrelated. Both Yodan and Godan build on the techniques and concepts introduced in the first three forms. In general terms, Yodan introduces some more advanced techniques and ideas - including how these concepts can be used in combination - and Godan develops these ideas yet further to include yet longer combinations and transitions. In each of these articles we will look at some examples from each of the Pinan / Heian katas to illustrate just how wide ranging they are in terms of their content, and to observe the progression in ranges and technical difficulty that we have just discussed. If you'd like a detailed look at the applications for the entire Pinan / Heian series, please see my video, 'Bunkai-Jutsu Volume 1: The Pinan / Heian Series'. In this first part, we will look at a couple of applications from Pinan Shodan (Heian Nidan) that will help us to understand the progression which is central to understanding the whole Pinan series. The most frequently occurring motion in Pinan Shodan is the Shuto-uke or 'Knife-Hand Block'. 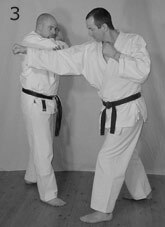 This movement is performed in a number of differing ways depending upon the style of karate being practised. However, regardless of the exact details, the Shuto-uke's primary purpose is to deflect and trap the opponent's arms before delivering a disabling strike. Pinan Shodan is primarily about the initial exchange of limbs and it is therefore not surprising that Shuto-uke occurs so frequently within it. For the purposes of this article we will look at two applications of the Shuto-ukes that are performed at forty-five degrees. 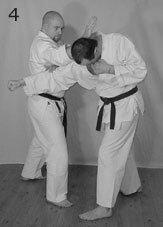 As you may already know, the reason the techniques are performed at an angle is to instruct the kata's practitioner that they should be at that angle, in relation to their opponent, when applying the technique. The opponent has attacked with a telegraphed wild swing. The karateka has shifted to a forty-five degree angle so that they are off the line of attack. As an additional measure, both arms are brought up in an instinctive cover in order to further reduce the chances of the opponent's strike landing (Fig 1). When the karateka feels the opponent's arm collide with theirs, the left arm wraps around the opponent's arm and then continues to pull them in the direction of the punch so that they are moved off balance. A strike is then delivered to the base of the opponent's skull (Fig 2). We can also utilise the Shuto-ukes at forty-five degrees should we shift to the outside. The opponent's arm has been parried across as the karateka shifts to a forty-five degree angle. This motion will limit any follow up from the opponent and will position the karateka to deliver a follow-up strike (Fig 3). The instant the karateka is in position, a strike is delivered to the base of the opponent's skull (Fig 4). We can see how the two applications we have looked at from Pinan Shodan (Heian Nidan) deal with the initial exchange of limbs and that they ensure that the karateka gains an advantage over the opponent. What we can already see is that the first kata of the series (in the original order) contains techniques for the first stages of the fight. This is primarily, although not exclusively, what Pinan Shodan addresses. There are a small number of techniques in Pinan Shodan that move on from this stage of the fight; however all those techniques are very simple to apply. What we can say is that all the applications of Pinan Shodan (Heian Nidan) are the kind of techniques that we would initially teach to beginners. 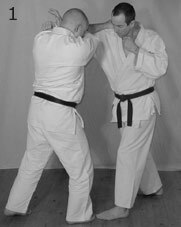 The techniques of Pinan Shodan either deal with the first stages of the fight, or are simple enough to be applied by those with relatively little skill and experience. Hence, so long as we are interested in the practical application of the Pinan / Heian series and not just their performance, we can begin to see the logic behind the original order of teaching. Once the techniques recorded in Pinan Shodan have been thoroughly understood, we should then move on to slightly more demanding methods (all techniques in the series are relatively straight forward, as is required for combative effectiveness) and techniques that address in more detail the subsequent stages of the fight. As we shall see in the second part of this series of articles, it is exactly those kinds of methods that Pinan Nidan (Heian Shodan) records.